This morning I responded to a Tulsa, Oklahoma message board that you can find on RootsWeb.com. I realized that what I had written may not be seen there by many who might need to know about this valuable resource for Tulsa research. So, I’m offering an edited version here. 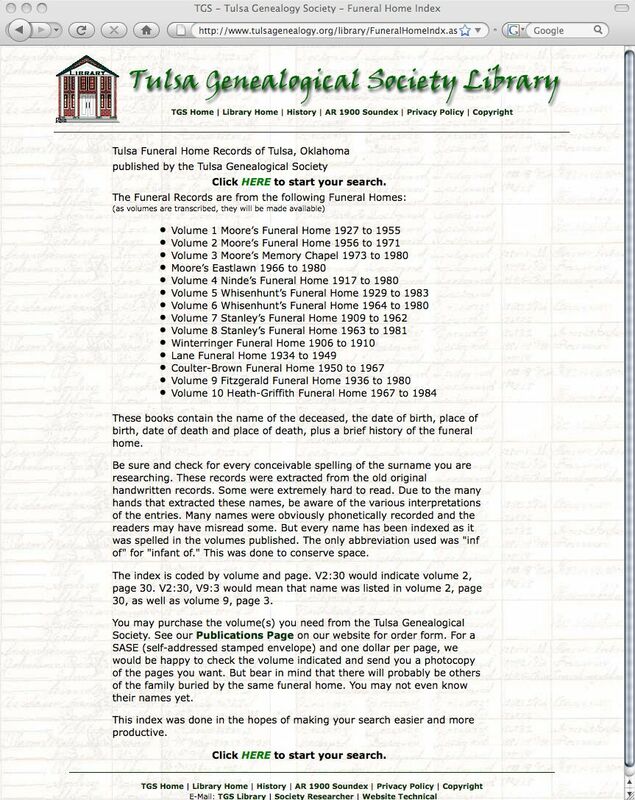 The Funeral Home Records of Tulsa was published in twelve volumes by the Tulsa Genealogical Society beginning in 1989. Through their work, it isn’t necessary to search through years of records to find the name of a person that you’re looking for. 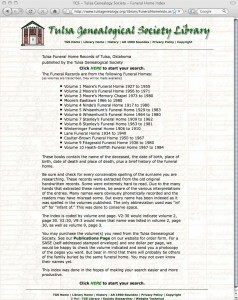 There is an index to the first ten volumes available online the Society’s website, http://www.tulsagenealogy.org/library/FuneralHomeIndx.asp, with which anyone can search for a name of someone whose record was handled by one of numerous Tulsa funeral homes. For those names that are listed in this cumulative index, you will find a volume and page number, which would lead you to additional information. For instance, Volume 1 includes the records of Moore’s Funeral Home for 1927-1955, extracted carefully by TGS members. TGS offers the volume for sale or will send a copy of the page with a self-addressed, stamped envelope and $1 per page (mail to P. O. Box 585, Tulsa 74101). Additional contact information, membership information, and descriptions of all of their publications may be found at their web site. TCCL’s Research Center (918-596-7977; http://www.tulsalibrary.org/askus/). I would suggest an e-mail or phone call to any of these libraries to learn the funeral home, date and place of birth and date and place of death, of the person you find in the TGS online index Or, purchase or locate a print copy of the Cumulative Funeral Home Index.